No, they don't choke the sun in some bizarre cosmic way. Sunchokes, also known as Jerusalem Artichokes are wonderful tuberous vegetable native to northern North America prided for their light and lightly sweet flavor and ability to be cooked in various ways. They're also really cheap. Their appearance is a lot like ginger root. But they taste vastly different. Whereas the sunchoke looks an awful lot like the ginger root on the outside, it couldn't be further away in color and taste on the inside. The ginger root has a pale-dark yellow flesh, and the taste is sharply spicy, extremely aromatic, and almost burning to the palate when cut just fresh. The sunchoke on the other hand is white and crisp in texture, like a potato, but the taste is like a light artichoke. Hence part of the name. They taste slightly sweet, have a mild bright flavor, and can take on other flavor profiles. They roast just beautifully and caramelize quite well, which only intensifies their underlying sweetness. The rest of the name, the "sun" part, comes from the flower that grows from the root: bright yellow daisy-like flowers reminiscent of the gargantuan sunflower. The sunchoke that we eat is actually the root of this flower, and can be grown easily in the right environment for both aesthetic and culinary uses. The sunshoke is a long-standing ingredient in North American Native American cuisine. When Sir Walter Raleigh of England landed in Virginia in the late 1500s, he brought back sunchokes in addition to potatoes and various other native foods to England. And thus they were first introduced to Europe. 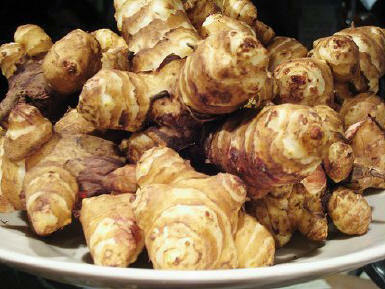 The French took a liking to the tubers and it is their cuisine that experimented the most with them. Samuel de Champlain brought them back to France in the early 1600s and they became known as the "Canada Potato" or "French Potato." In fact, the French named the sunchokes topinambour which means "poor uneducated person" in French, and it is from there we get the random German liquor called Topinambur which is made from sunchokes. Despite its deliciousness, the sunchoke took a while to catch on in Europe. A rumor started that eating sunchokes would lead to leprosy, because the way the tubers are shaped is very similar to the fingers of a person suffering from leprosy. Well eventually they caught on. And today sunchokes are often consumed as a substitute for potatoes because they can be prepared in the same exact ways a potato can be. It's a wonderful ingredient if you're watching your weight with low-carb or are diabetic. An unfortunate side effect to consuming sunchokes however is insane gas. I mean epic, can power cars type of gas. The problem is the unilin. Unilin is a polysaccharide, and sometimes our bodies have difficulty digesting polysaccharides. Some polysaccharide (aka unilin) veggies include jicama, garlic, onions, and sunchokes. You won't die, but you'll get very painful bloating and horrible gas if your body is sensitive to these. But there is hope. Eating these foods in very small amounts, gradually increasing the amount and frequency will "teach" your body to develop a tolerance for them. Also, the inulin is strongest when raw, so if you cook the hell out of these veggies your reactions should be more minimal. This helps explain why someone who's allergic to onions for example can actually eat a bowl of pasta with marinara sauce; the onions have been cooking and stewing for an hour at least, so the inulin has been all but broken down completely. So don't be detered in trying these guys out. In terms of cooking, the sunchoke functions a lot like a potato. You can boil them, roast them, steam them, fry them, puree them, or even eat them raw although raw is often served very thinly sliced. The underlying sugars and sweetness again give to wonderful caramelization, so if you want to experience the truest taste of the sunchoke in my opinion it's best to roast them as their natural flavor like all ingredients can get boiled out when just boiling. Here's a really simple recipe for a soup using sunchokes and asparagus together, which I think is an incredible flavor. Roasting the garlic with the unchokes continues the underlying sweet flavor of this soup which pairs beautifully with some savory-spiced salmon on top. Toss the sunchokes and garlic in the 2 Tbsp of olive oil and season with a small pinch of salt and pepper. Place in oven and roast until very tender, about 30-40 minutes. Watch it carefully so as not to burn, but you do want some good caramelization (i.e. golden brownness) because that's the flavor of this dish. While they roast, prepare the base of the soup. Heat the remaining 2 Tbsp of olive oil in a pot and add the onions. Season with a pinch of salt and pepper and saute on medium-low heat until onions are very soft and turn translucent. Set aside. Once the sunchokes and garlic are roasted, transfer them and the sauteed onions along with any oil from both to a food processor or blender and process until smooth and thick. *** Return the puree to the pot and heat on low. Add the stock and mix in to combine. Add the fresh thyme and cook for 10 minutes so flavors can combine and infuse with each other. To serve, ladle soup out and top with blanched asparagus tips and flaked cooked salmon. *To help with the digestion you can peel the sunchokes. Otherwise, their skin is very tender and therefor no need to peel when eating. **This is a great way to use up those asparagus ends we always cut off because they're so tough to eat. However, they give wonderful flavor, so they're perfect to add to soups or stocks to infuse, then simply remove after cooking and discard. ***If you have an immersion blender you can throw all the ingredients in the pot and puree it all at once together with the immersion blender.